Beige Carpeting Same Great Workmanship - At a Value Price. 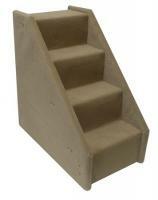 The Value Line dog steps are constructed from OSB and needle punch carpet which is similar to automobile carpeting. 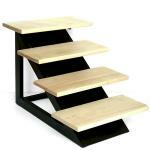 These are less costly materials that do not impact the reliability of the pet steps. The carpet is thinner than the standard commercial carpet so the screws will be more visible. However, from a short distance away the Value Line looks very similar to the standard Bear's Stairs models. "Enjoyed doing business with you. And I will again."